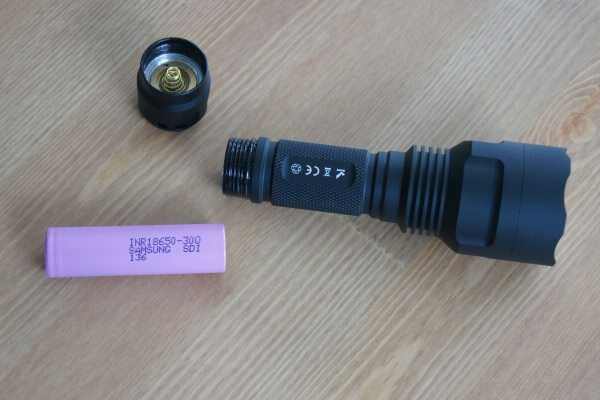 This is a review of the Astrolux C8 flashlight. Basically, this is a Convoy C8 flashlight host, using a FET driver for 60% more output and intensity than the Convoy C8. 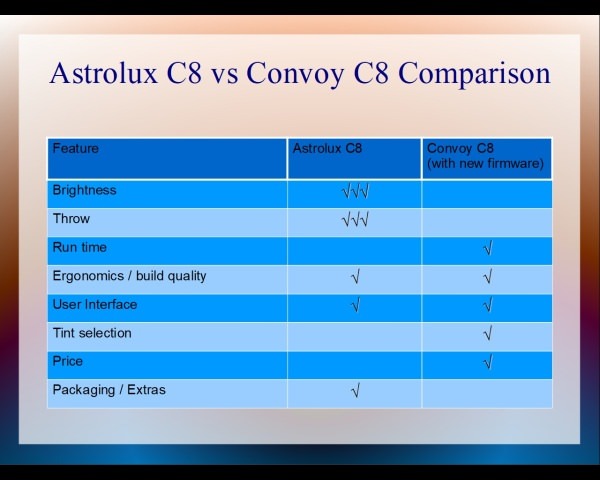 Specifically, the Astrolux C8 uses a FET+1 driver. The FET driver is used on high modes for maximum output, and the 7135 driver is used on low and medium modes for efficient and regulated output. 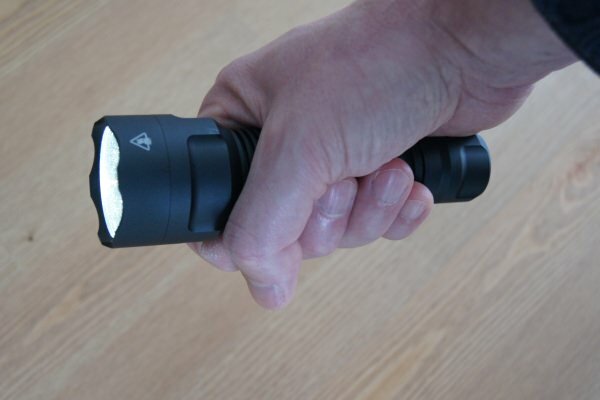 The LED is a Cree XP-L HI, available in neutral or cool white. A single 18650 battery is used to power the light, and a high-drain cell (such as the Samsung 30Q) is recommended for best performance. 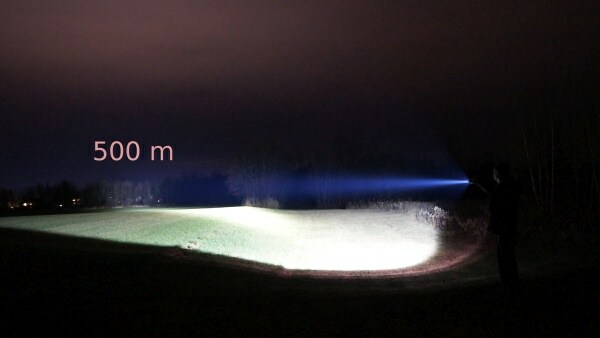 The light achieves a maximum output of 1300 lumens, and a candella of 100,000 for a throw of 640 meters. I think this may be the longest throwing budget light available in stock form. Other than the high output and throw, one of the things I like most about this light is that it uses the same user interface as the BLF A6. This is a great interface, and allows both forward and backward stepping through mode levels. Best of all, the strobes are hidden. 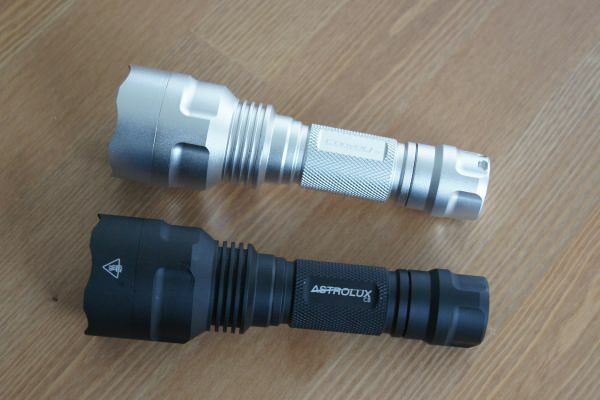 The Astrolux C8 is a well-made light, constructed of anodized aluminum, that is reasonably compact. 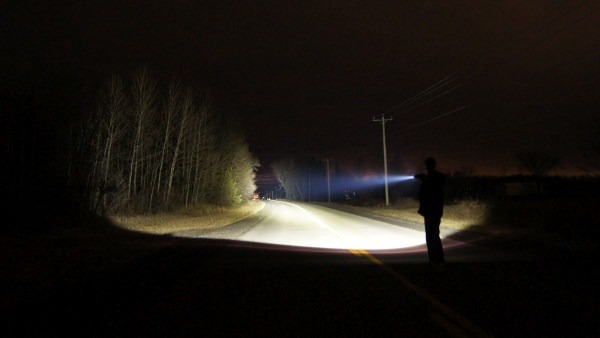 As far as I can tell, the host is identical to the Convoy C8 (except color), which is also a very well-made light. The light is designed for throw, with a large smooth reflector, and a Cree XP-L HI LED to maximize throw. However, there is a reasonable amount of useful spill, so you won’t get a feeling of “tunnel vision” when using the light. 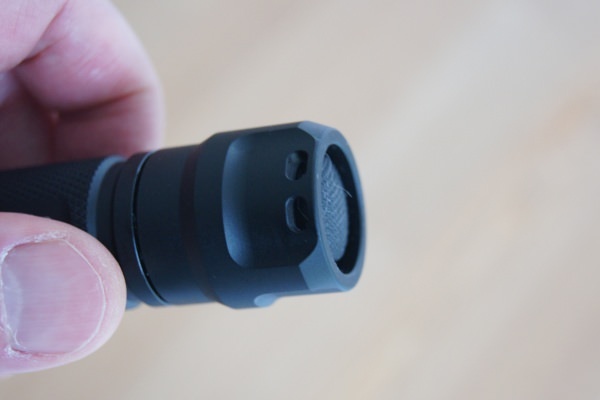 Like other C8 lights, it has a good feel to it, and is easy to carry in a pocket. I usually carry a Convoy C8 on a lanyard around my neck, when on walks or bike rides. However, due to the extra throw of the Astrolux C8, I will now be carrying it instead. The difference in throw is very noticable, as I will show in comparision images below. The FET driver allows for an output of 1300 lumens (my measurements), using a freshly-charged Samsung 30Q 18650 battery. This compares to an output of 800 lumens (my measurements) of the Convoy C8 (same tint), using its 8×7135 driver. 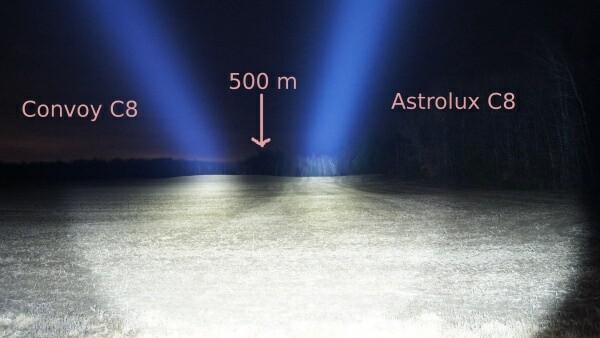 The intensity of the Astrolux beam is also 60% greater, as expected due to the identical LED and reflector design. One downside of the FET driver is that as the battery depletes, the light will gradually dim. For example, by the time the battery is down to a resting voltage of 3.72v (approximately 50% depleted), the Astrolux C8 maximum output is down to 900 lumens (losing over 30% brightness). However, I find the Convoy C8 also suffers from dimming output, despite using 7135 drivers. I think that using 8 7135 chips prevents them from allowing full regulation. 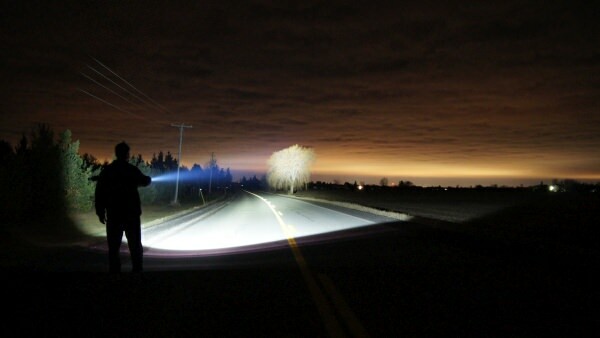 The Convoy drops to only 600 lumens, using the Samsung 30Q battery at 50% charge. So, I think it’s very important to keep your battery charged, regardless of what C8 you use. A built-in battery check helps in this regard. Finally, the user interface of the Astrolux C8 is fantastic. 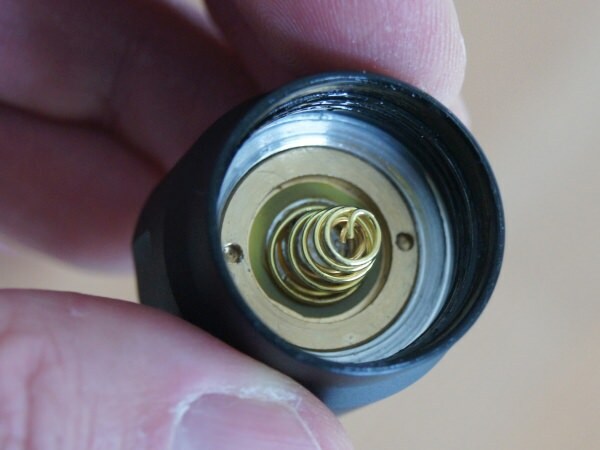 It is identical to the BLF A6 interface. That is, it supports both “short” clicks (0.5s or less), and “medium” clicks (0.5s to 1.5s). Short clicks advance mode levels, and medium clicks reverse mode levels. There are a total of 7 modes, from moonlight through maximum. Or, you can program in a 4-mode group, which is my favorite. Mode memory can also be turned on or off. My preference is on, so that when I’m using the light on maximum, it remembers maximum for next time I turn on the light. Hidden strobes and battery-check mode can be accessed by a medium press from the lowest mode. My only complaint is that there is a 45-second step-down when using the light on maximum. 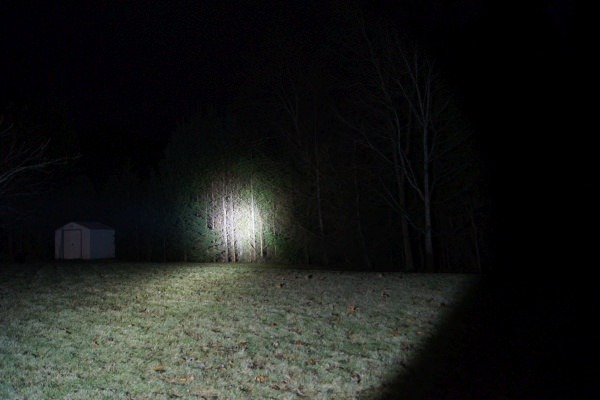 This steps down from 1300 lumens to 800 lumens (the same output as the Convoy C8’s maximum brightness). I completely understand the need for a step-down (this is a bright light that produces a lot of heat). 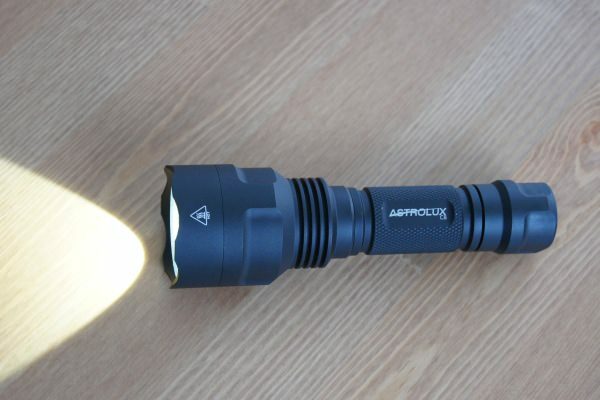 However, unlike the BLF A6, the Astrolux C8 has much more thermal mass and can take about 3 minutes of maximum output before getting too hot. IMO, they should have set the timer to 3-minutes, not 45 seconds. Luckily, it’s very easy (short click) to bump the light up to maximum again. The Convoy C8’s biscotti interface (available on the silver version) is also a very nice interface. I’m not sure which I prefer, but I like them both. They’re similar. 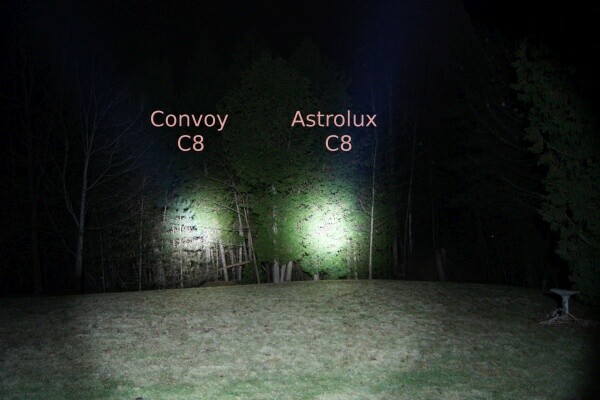 An overview of the Astrolux C8 specs follow. I give more details later in the review, as well as a comparison to the Convoy C8. My own measurements line up extremely close to Astrolux’s specs (well within my margin of error). You can find the manufacturer’s specs in the site link above. 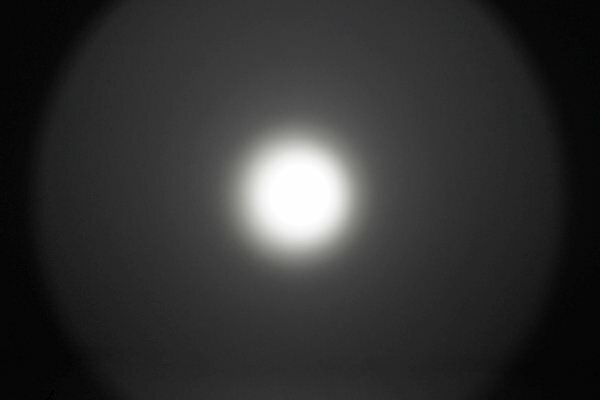 Modes: 4 or 7 (moonlight, low, medium 1, medium 2, high 1, high 2, maximum). Plus, some strobes. The light can be programmed to have mode memory on or off. 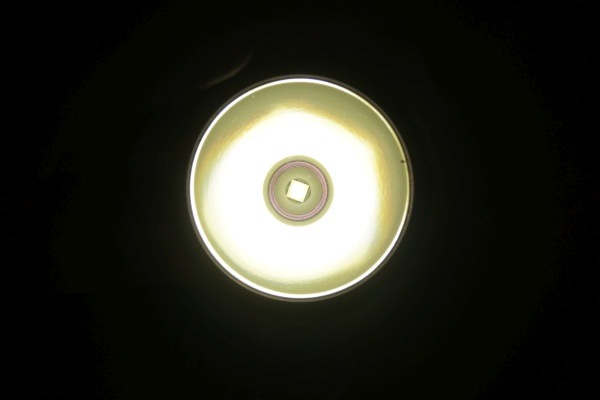 LED: Cree XP-L HI, 4800K neutral white, or cool white. Lens: anti-reflection coated. Protected by bezel. Weight: 197g with a Samsung 30Q battery installed. Construction: Black anodized aluminum. Waterproof and drop-proof (2 meter). Good grip on body. Threads are very nicely square cut, and came lubricated. Space on tail for a lanyard (included). Feels solid and well built. Battery type: 1 × 18650 lithium-ion. High-drain recommended. The light has low-voltage protection. Output: 1300 lumens maximum (FET driver). 150 lumens on the middle-mode (uses 7135 driver). The 7135 driver (medium and lower modes) are well regulated. Throw: 100,000 candela. This represents a throw of 640 meters to 0.25 lux. It’s very impressive for such a small light. 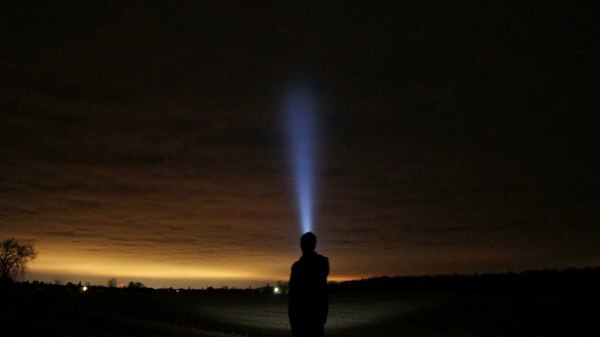 I find it’s usable out to about 400 or 500 meters, as long as your eyes are dark-adapted. Heat: The light will get hot on maximum. A timed step-down prevents overheating, but you can bump it back up to max a few times without worry. Tint: 4800K neutral white. I’m not sure what the cool-white is, but I suspect about 6500K. Beam pattern: It has a bright hot-spot, and some usable spill. PWM: I could not detect any PWM either with my eyes or with a high shutter speed camera, but it very likely uses it on modes other than maximum and medium (where the drivers are running constant). 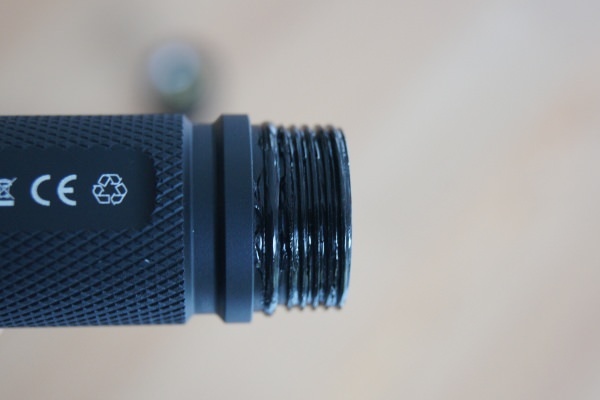 You can optionally lock out the light by slightly unscrewing the tail cap (due to anodized threads). - Very very bright, very very good throw! - Great user-interface. Nice mode spacing. Ability to remember modes so you can use it as a “maximum-only” light if you wish. - Well made. Waterproof to 2m, drop-proof from 1.5m. - Available in a neutral white tint. - Very good price/value for this design. - The step-down timer should be longer. 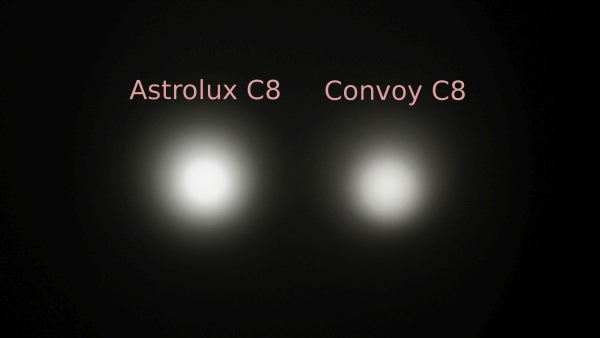 Here is a chart on how I rate it against the Convoy C8. And now, for some pictures. Contains spare o-rings and a basic lanyard. It comes in nice box, and is well protected. Here is a side-by-side beamshot. Note that the Astrolux is a lot brighter. Those images look like Astrolux fins are a little deeper. Is that the case? I don’t think so. At least not by eye, or by measuring with what I have. If there is any difference, it’s in the small fractions of a millimeter. I think the design is the same. WalkIntoTheLight, thanks for the review. I got an Astrolux C8 last week and it’s my new favorite in the C8 style. It makes a good pair with my BLF A6 due to the drivers being the same. I also have a Manta Ray C8mini and am impressed how well it throws even though it is more like a P60 in size and so is more pocketable. I suppose that I should get one of the Sofirn C8A to compare. I already have one of the Sofirn C8F (3 XPL) and its a great floodlight. It’s a little sad that the new lights that I have been buying lately have knocked out the pair of XinTDs that I have been using for several years. This year, new and improved C8 style lights have been falling like mana from heaven. That is one impressive little light with so much punch. I am teetering on the edge, to get it or not…probably will before the day is over. This is the war of the C8’s lately! I also have on order one of the Manta Ray C8s that uses 12*7135 current regulators (4.2Amps). We’ll see which feels better to use. It would be interesting to see a brightness comparison between a FET driver (the Astrolux C8) and a 12×7135 design. The FET will win of course (you can’t do better than direct-drive, unless you have a boost circuit), but I wonder by how much? I haven’t been too impressed by how the Convoy 8×7135 holds up brightness as the battery drains, which makes me suspect that too many 7135’s drop voltage too much and can’t power the light as much as intended. I’m suspicious that 12×7135 might not do much better than 8×7135. Anyway, if you get a chance, please let us know how it performs against a 8×7135 design. Thanks. Yes, we’re getting so many good lights coming out in 2017, it’s going to hard to beat next year. I ordered one last night after reading WalkIntoTheLight’s review. Just got to wait now to see what it’s like in person in 6-9 days time ;). I doubt between the sofirn c8t and the astrolux. 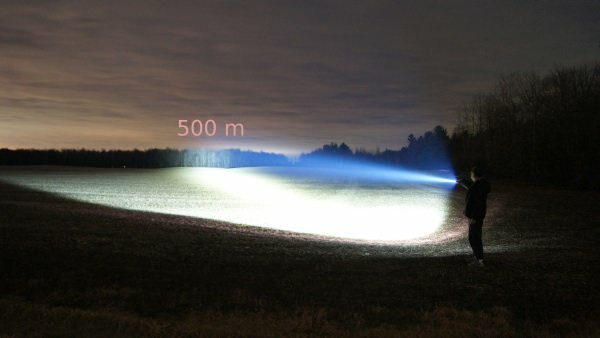 I have seen two video reviews of both flashlights, maybe someone has them both to compare? is the pill Swappable or Built into the Host like the Convoy C8 ? I like the idea of having a thrower that has the same interface as my EDC A6. The whole tint thing confuses me – is the 1A or 3B tint prefered in a thrower? I think I recall that one is perceived as brighter at a distance even if color rendition is not as good? I had a spare Astrolux S1 driver and put it into the clear convoy C8. I pretty much have the same light. For the price it’s a great compact thrower. Yes, it’s noticeable on a white-wall. The Astrolux is a bit more “crisp” than the Convoy. However, when I did lux tests, I didn’t notice any difference in hot-spot intensity that wasn’t attributable to the extra brightness of the Astrolux. So, I’m not sure it makes much difference in real usage. It might make a few percent difference, but that’s within my margin of error. The extra 60% brightness is by far the biggest factor. hard to believe this little light throws as far (or further) compared to my Thorfire S70S. Will be interesting to compare the two. Of course the Thorfire will have much more light over-all. Amazing how much $20 can get you nowadays. Amazing how much $20 can get you nowadays. Yes, it is. 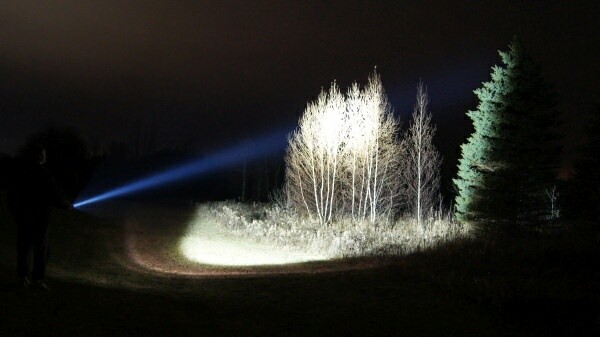 Up until I bought a couple of Convoy C8’s this year, I was mainly using one of my 4xAA lights as a compact “thrower”. They did the job almost as well, but are heavy, bulky, and significantly more expensive. I really like the C8 format for a compact thrower. Coupled with a FET driver like in the Astrolux, it really throws well. You can get spoiled if using a multiple-18650 light that both throws and blasts a wall of light. But, they’re not very practical to carry because of their bulk. i am not a modder, at least yet, but is this light mod friendly? i see there is a whole lot of modding going on, on the convoy c8. i am not a modder, at least yet, but is this light mod friendly? i see there is a whole lot of modding going on, on the convoy c8. If you are happy with the UI, all you should need to do is bypass the springs. And nice review. I like the outdoor pics. On this light, how much would the output increase with bypassed springs (30Q’s)? 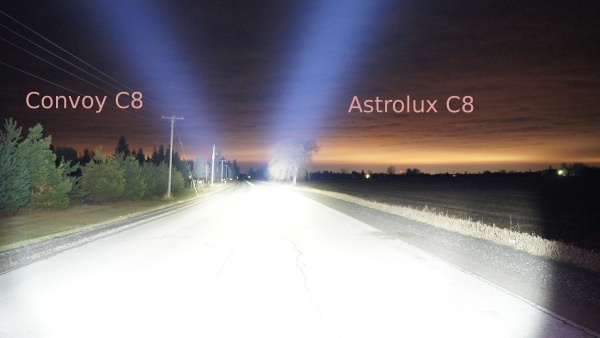 Anyone who got it both please compare between Sofirn C8T vs Astrolux C8. 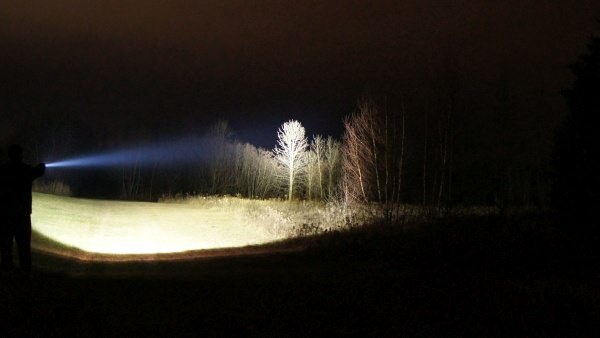 Based on what you get if you do it on the BLF A6, you’ll probably get a boost to 1500 or 1600 lumens. So, maybe 20% or 25% brighter. I like my XinTD C8 V5, but this one is a little better using a FET. The Manta Ray C8 with 12×7135 has arrived. The Astrolux C8 is clearly better in most ways. 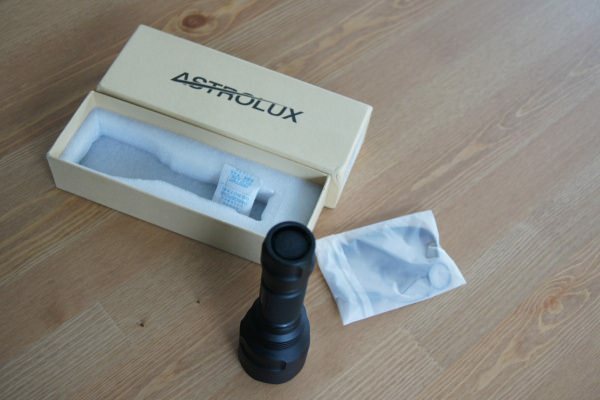 Astrolux wins in brightness and throw as well as overall build quality. The fit and finish of the Manta Ray feels cheaper from the finish to the “skinny” threads. The driver has 3 stars, one of which is connected to the outer ring. It looks like the owner could change mode groups between one mode, 3 mode or 5 mode (with strobe and SOS) by breaking the track from one star and soldering another star. A few years ago the Manta Ray would have been “hot stuff”……not now. The 12×7135 do put out more light than an 8×7135 setup, at least in the beginning. I have not done any long runtime comparisons. Just got this light a couple of days ago. Absolutely love the throw. I have trouble getting to the hidden strobe, but its a thrower so not a huge deal. I also ordered the Sofirn c8 yesterday so will find out which I like best soon but its going to be hard to beat the Astrolux. Just placed the order for mine. The hidden strobes can be accessed by a “medium press” from the lowest mode. A medium press is defined as a half-press (or off/on) between 0.5s and 1.5s. First medium press gives you turbo, next medium press gives you the 1st strobe, etc. You can also get to turbo via the regular “short presses” (0.5s or less), but that’s on the normal mode grouping and you can’t get to the hidden strobes from there. It can take some practice to get it right, but IMO it’s a great way to keep those strobes hidden except when you really want them. The Convoy allows you to pick from a lot more mode groups, so you can hide the strobes that way. However, then you can never get to strobes (or battery check which is what I use). My ideal thrower would be a single mode turbo, plus a hidden battery-check mode. AFAIK, nobody has such an interface. I suppose if you have a firmware burner, you could program your own interface. But, I’m content to just use mode memory so it remembers that I’m in turbo.